In Round 4 Alkaloid won against Keystone with a marginal 3.5-2.5 win to become the sole leader of Men's European Club Cup with 8 points. Baden Baden made a draw against Bosna Sarajevo while Tomsk-400 and Ural Sverdlovskaya were not able to grab 2 points from their encounter. In women's ECC, Tbilisi and Monte Carlo, faced each other. The strong Monaco team was the rating favorite but the match ended as a draw. 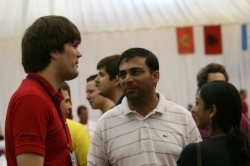 World Champion Vishwanathan Anand came to the tournament hall to hail the congratulations. 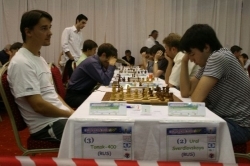 Another great day of chess with the fourth round of the 2007 European club championship in Kemer. In the men section, the match of the day between the Russian clubs of Tomsk 4000 and Sverdlovskaya finished with 6 draws. Alkaloid from Macedonia overcame Keystone of Ukraine 2 and half 3 and half, thanks to two important victories of Kiril Georgiev and Trace Nedev. The German team of Baden Baden lost another point today when its players could not manage to overcome the team of Bosna. Carlsen and Nisepeanu score for the German and MovseSian and Short did it for Bosnia. Thanks to the victory of Spanish international master Perez Candelario, the Spanish team of Linex beat Gros Xake Taldera of Spain and is now sharing the third place of tournament. The new 2007 world chess champion Vishy Anand was greeted by all the players when he arrived today in Kemer maybe on time to help the German team of Baden Baden to take its first European Cup? In the women section, the dream team of Monte Carlo faced the champion of Geogia, the club of Interplasi Tbilissi. If on paper the Monegasque were clear favorite on the boards the results were certainly not clear until the end. The second world ranked women player Humpy Koneru from India score her 4th victoriy in a row but surprisingly the former women world champion 2001 Zhu Chen from Quatar lost to Nana Dzagnidze. Cramling shared the point with Gvetadze and finally Monica Socko escaped with a draw in a lost game against Maia Lomineishvili The major upset of the day was the defeat of the Russian team of Ural Cheliabinsk to Ladya Kazan 2 and half 1 and half, thanks to a late victory of Shaiduliana to Julia Kochetkova. Tonight the team of Monte Carlo and Tbilissi are shared the lead with 7 points followed by four teams with 6 points which include Yerevan, Cheliabinsk, Saint Petersburg and Kazan.